It was a case of honours even in Ballymoney as a penalty save prevented County Armagh from securing full points against Komazawa University. The scoreless draw arrived despite a number of scoring opportunities created against the visitors from Japan - with the Orchard County camp disappointed in the draw but picking out the positives from the performance. 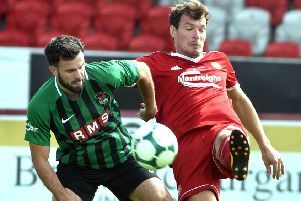 “We were very strong at the back in terms of defensive organisation, plus good in midfield,” said County Armagh Premier manager Brendan Grimes. “It was frustrating to come away with a point compared to the win, especially as the goalkeeper pulled off a fine penalty save. COUNTY ARMAGH: Tyler Boyce (Lurgan Town), Ben Davison (Annagh Utd), Daniel Neill (Portadown), Sam Murphy (Dungannon Swifts), Lee Upton (Portadown), Luke Wilson (Portadown), Cahal McGinty (Dungannon Swifts), Tom Weir (Portadown), Mark Lucas (Glenavon), Ryan Latifi (Portadown), Pablo Andrade (Linfield). Subs (used): Andrew McAlinden (Lurgan Celtic), Ryan Carmichael (Portadown), Oisin Smyth (Dungannon Swifts), Ryan Leeman (Loughgall).